Offering a variety of treatments designed specifically for your hair type. 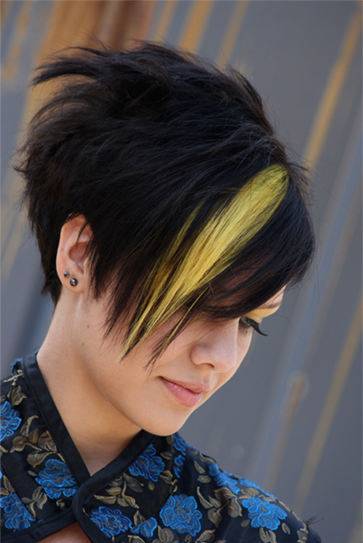 Stylist pricing is based on education, experience & availability. All students pay only 20 bucks every Tuesday with select stylists. Simply show us your school ID and all you pay is $20. Our beauty consultants are available to help you with all your needs for your special day. We would be honored to be part of such a special occasion! All bridal packages are custom designed to accommodate your wishes and desires. Life’s difficulties happen to nice people. If illness falls your way, the staff at Salon Moxi are here for you or a loved one. We offer personal grooming for home and hospital bound individuals. We have a specially trained team available to assist individuals experiencing hair loss due to medical treatment. An understanding, friendly approach can make a difference at such a trying time. Contact Sam Lavella for details. Occasionally, Salon Moxi needs models for photo shoots, workshops and training events. This is a great opportunity for aspiring models or anyone wishing to take advantage of complimentary services. Please contact the salon coordinator for details. We, at Salon Moxi are committed to the community in which we live. We are available to community groups for gift baskets, beauty event planning, fashion shows or in any way we may be of service. Moxi specialists are available to speak at your events, luncheons or meetings. A Moxi Card is a great way to show you care! Moxi cards can be purchased for any amount. Let us help you design a special gift package that is worthy of the occasion.